Today is a special occasion in my house: on this very same day, seven years ago, we got married! I haven’t decided how to mark the day yet (I am thinking amazing, extravagant dinner? Food is always a good option for celebrations I believe), but hoping for some anniversary inspiration I spent my afternoon yesterday looking at my wedding photos and decided to share some with you. Don’t worry: I am not going to bore you with photos of people you don’t know and don’t care about: in true travel blogger style, I am going to use my wedding anniversary as one more excuse to indulge in my memories while presenting to you two destinations you might not know but are worth a visit: the medieval village of Anguillara Sabazia and the lake of Martignano, near Rome. Anguillara and Martignano are easy to reach from the city and they are the perfect escape from Rome in the summer if you are looking for a pleasant day trip to get some fresh air and lake views. I am going to tell you in detail about the, but first, let me indulge in a little bit of backgrounds about us. This is us 7 years ago: aren’t we cute together? We are an international couple: I am Italian, my husband is Irish and our lives crossed in Brussels. We were both working for the European Institutions at the time and I like to say that the European Union is responsible for the existence of your family: not only was Brussels the reason we met, but low-cost European flights helped us being together when work brought us apart (oh the romance of meeting in Paris, Barcelona, London, all for 5 euro a flight!) and when we decided to move in together, freedom of movement meant that finding jobs abroad was easy. I know I sound like an ad for the EU, but it gave me my husband and my kids, how can I not be a fan? When we decided to get married, we considered Ireland, Belgium and Italy but it soon became clear that Italy was the favourite: friends demanded an excuse for a sun holiday, we were ourselves very attracted by the idea of a summer wedding in the country and Italian food was hands down the best – the decision was easily made. Since we had many friends flying in from different countries, we needed somewhere close to a big airport and easy to reach without a car. We also wanted a place where people could relax and feel on holiday and finally, we wanted a location that would allow us to have the wedding day we both wanted: a fun, relaxed day with no stress for anyone (including me), full of food and a joyous and upbeat atmospheres. Being the bride and being Italian I felt I needed to come up with a pretty spectacular place and finally I had a moment of genius: all the elements we wanted were in a place near Rome that I had known since my childhood: we got married in Anguillara, a beautiful, really ‘Italian’ looking village and then we moved to lake Martignano for lunch and a full day of celebrations. We started our day with the wedding ceremony in Anguillara, where we met all our friends. The group was made of about 80 people and even if small, for an Italian wedding, we soon filled the square of the small village. The day was unusually hot for the end of May and, shirt collars loosened and shawls thrown to the side, people gathered in the ceremony room. Italy does not do air conditioning well (or at all), but pretty views are its specialties: the painted ceilings of the mayor’s office and the picture window framing the lake outside made up for the climate! Anguillara Sabazia, or simply Anguilla as it is usually called, is a small town to the northwest or Rome: it’s perched on a promontory on lake Bracciano and can be reached by train or with a short drive from the city. Its history dates back to republican Roman times, but the current village is reminiscent of a medieval town, more than an ancient roman settlement; winding, cobbled streets, hidden stairways, balconies and a tower, it’s the Middle ages in Italy as we imagine it, with all its old world charm. If you haven’t been to Lazio, the region of Rome, the many architectural elements I just mentioned may evoke an imagine of town similar to the famous ones in Tuscany, but the differences between the two are significant. Tuscany is fantastic, but it’s a wealthy region tourist love and you can see signs of this in its manicured porches, symmetrical brickwork, and orderly gardens. Compared with that Anguillara, and Lazio in general is more real, more authentic if you pass me this used and abused word. Anguillara is is not picture perfect: its cobbled streets are bumpy, plants sprawl at the sides of the streets and tv antennas do crowd the sky, but it is beautiful and it makes you see Italy for how it really is: caught between the past and the future, always charming and always incredibly alluring. 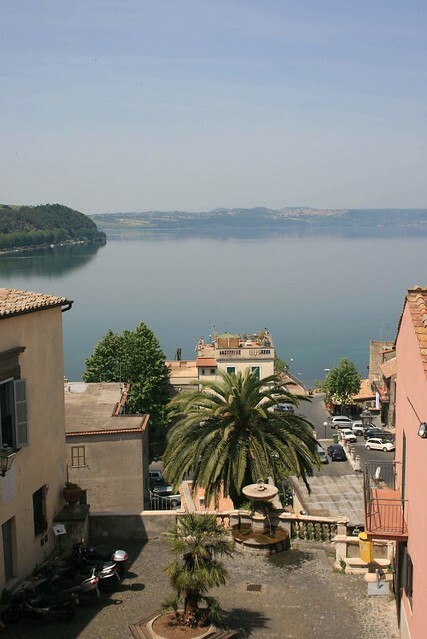 What to do: Anguillara is a lovely village but its highlight is the lake. You have some nice beaches just at the bottom of the promontory with rowing boats and pedal boats: the many lake view restaurants make it perfect for a lunch out. In the actual village, make sure you check out the medieval tower and the ‘Collegiata’ (church), on the highest point of the town. After the ceremony in Anguilla, we moved family and friends to the shores of smaller lake Martignano. Despite being just a few kilometers away, Lake Martignano has a completely different feel from its bigger neighbour: unlike Lake Bracciano, wide and busy, Martignano is smaller and entirely surrounded by nature. Only few buildings are allowed on its shores, and it exists in a slower, more secluded dimension. Entirely surrounded by hills (the lakes in this area are all volcanic in origin) there are only a couple of roads allowing access to it and they should both be approach with caution: while not perilous as such, they are unpaved and to get you an idea of how bad things can get, I will tell you that the bus with all my guests got stuck and had to let them all out until the engine cooled down – they were all pretty chilled out about it, but it must have been quite a scene: 80 or so people in cocktail attire, on a dirt track under the Italian sun! The view and the meal they got at the end made up for the mishap. We chose to have a simple enough wedding and picked the restaurant called Casale di Martignano to have a full day of celebrations. The restaurant was kind enough to close for us for the day and give us full use of the facilities, but if you are visiting for the day it operates an excellent restaurant service and also has rooms for the night. There are many things love about this place. First, the food. Casale di Martignano is a working farm and they only work with fresh genuine ingredients. You can taste this in every bite and both their food and their wine has that unmistakable taste that tells you the produce is fresh, local and cooked with passion. In terms of location, it ticks all the boxes of the no fuss lake escape: you can eat overlooking the water, you can lounge in the lawn gently sloping through the water, you can swim or do what became the signature activity of our wedding day: take out the pedal and rowing boats! Finally, the place caters really well for families: as well as the shallow waters and the beautiful lawn, il Casale also offers guided activities for children so they can learn how a farm works and discover how food is really made. It is a fantastic place for a day out one I cannot recommend enough for a summer escape from Rome (or a wedding day, I don’t’ mind sharing!). Do you know this area of Italy? what is your favourite day excursion from Rome?